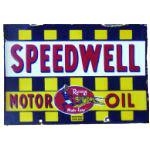 This antique sign advertises the Co-Op Motor Oil. The sign is a circle. The circle is orange, and has a thin green border and green text. “Gasoline Motor Oil” the message reads. The center of the message has the word Co-Op. The two “Os” are joined by two hands grasping one another.